Providing T.I.G and M.I.G Welding, Megarweld Services of Wolverhampton Specialise in the Welding of Aluminium, Titanium, Stainless Steel and Pre-toughened Steel. As one of the West Midlands best known specialist welding companies, Megarweld Services of Wolverhampton are reputed for their expertise in welding technology. Understanding materials and engineering problems are important in order to provide engineering solutions in manufacturing and construction environments. 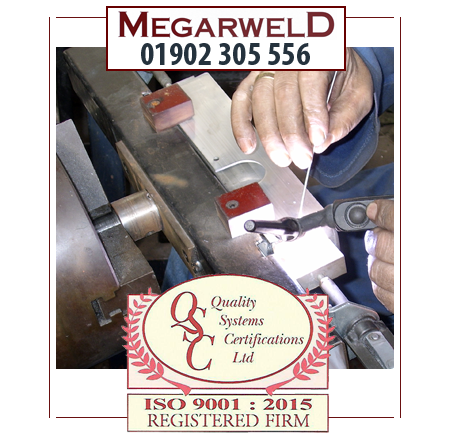 With considerable expertise in repairs and re-manufacturing of machine tools to moulding and diecast industries, Megarweld are reputed for their ability to provide a prompt and efficient service for tool repairs and for specialist welding services including the manufacture of small quantity fabrications. For repairs to existing machinery and fabrications, Megarweld engineers can conduct a weld failure analysis in order to provide an engineering solution. Their ability to work with a wide range of materials including Aluminium, Titanium, Stainless Steel and Pre-toughened Steel using welding procedures which include Arc, MMA, M.I.G, T.I.G, Brazing and Stud Welding help to provide the most appropriate solution quickly, efficiently and from in-house expertise. Specialist Welding Services for Machine Tool Repairs, On-Site Specialist Welding and Short Run Steel Fabrication - Megarweld Services of Wolverhampton provide Experienced Welding Engineers to manufacturing and construction industries across the Midlands - call Megarweld Services of Wolverhampton on 01902 305 556. Megarweld Services - T.I.G and M.I.G Welding Specialists in Wolverhampton.